My Impressions on "Onna Joshu Naotora"
I write about my impressions on "Onna Joshu Naotora". Needless to say, this is my personal opinion. At first, I really enjoyed Tomboyish O-Towa, her family and friends and her negotiation with IMAGAWA Yoshimoto despite being a little girl made me expect the development of the story. And the words of the Zen sect and medieval customs and things in it are interesting. However, the situation changes after she becomes a chatelaine and ruler of Ii-no-ya. She becomes to do or say things that are convenient to her. And ONO Masatsugu, who should oppose her in various respects until his death takes her side. Beside the priests in Ryotanji Temple and her mother Yuchinn-ni (Chika) become to accept everything she says. Then things go smoothly according to her plan. It is impossible and lacks the charm of Taiga Drama series. Most of the series in the past, the main character overcomes difficulties and grows up and it attracted many viewers. Indeed the Ii clan is destroyed by the army of TAKEDA Shingen, Naotora marries Ryuunmaru after it and lives a happy life as farmer but insists that she never transfers the headship of the clan to Toramatsu, later Naomasa. It's strange. Maybe this is not the series we Japanese think what the series should be. 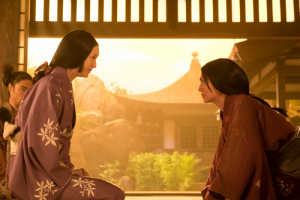 The audience rating of "Hana Moyu" went up in the latter half of the series but "Onna Joshu Naotora" didn't. 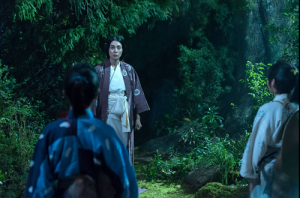 Its rating was low for the series that is set in Sengoku period but the executive producers Yukie Okamoto and Hirotoshi Matsukawa and Yoshiko Morishita, who writes the scenario show no sign of regret. They learn very few things or nothing from the failure of "Hana Moyu", the series doesn't describe the details of the affairs in the middle of the 19th century and that's one of the reasons why it's criticised. SUGI Fumi, main character of "Hana Moyu" is a younger sister of YOSHIDA Shoin is surrounded by four men includes her brother Shoin. 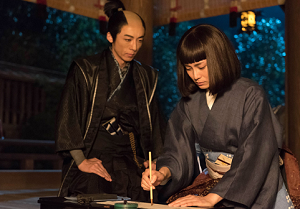 And in "Onna Joshu Naotora", the story developes O-Towa (Naotora) and four men - II Naochika, ONO Masatsugu, Ryuunmary and Toramatsu (Manchiyo), later II Naomasa. The two series are similar in this respect also. However I'm satisfied with the description of IMAGAWA Ujizane in this series. It7s not too good but not too bad. If the Imagawa clan had been featured, I could have enjoyed it more. Anyway, I hope to watch solid one next year. She is a fictional figure but is modeled on a daughter of NIINO Samanosuke who actually existed. In this series, she has two younger sisters and makes them marry the vassals of the Imagawa clan and the Hojo clan. She is good at doing embroidery (*) and her works are sold by SETO Hokyu who finally marries her. 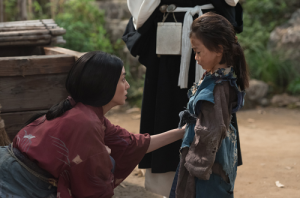 As the eldest daughter of the Niino Family, she sometimes talks with Naotora (O-Towa) and lives with Shino and Toramatsu after the death of Naochika. (*) First of all, Yasuko Mitsuura who acts her likes doing embroidery. 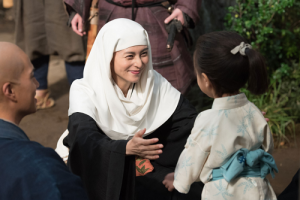 The image shows Yasuko Mitsuura as Ayame. After the Honnoji Incident, AKECHI Mitsuhide is defeated by HASHIBA Hideyoshi. TOKUGAWA Ieyasu knows it on his way to support Hideyoshi. Then he plans to invade the territory of Nobunaga and opposes the Hojo clan. O-Towa thinks to take Jinen to a hidden village but Manchiyo appears and tells her to hand over the boy to him. And O-Dai no kata, who also appears there (*) orders her to do so. But O-Towa and Ketsuzan resuse their request and tell them he is a son of Nobunaga. Besides they show a tea cup given by Nobunaga before and says it's in return to look after him. After that he becomes a monk and O-Towa still lives Ii-no-ya to take care of unfortunate people though many of her relatives left there. But she becomes to have a fit of coughing occasionally. O-Towa visits Kondo Yasumochi and tells him to continue to have a relationship with him but becomes ill and is forced to be laid up with it. 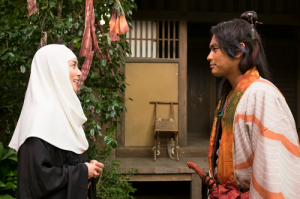 Nankei tells her that her cold gets worse and she tells him that she hopes to survive and see that Japan is united under the flag of Ieyasu and the Ii clan will unite under their flag again. One night she who cannot sleep hears the sound of a flute sound and goes to the well of Ryugu-kozo. There she finds young Naochika (Kamenojo) and Masatsugu (Tsurumaru). And young Ryuunmaru (**) appears there. They offer her who is also a girl now to join them. But she says she still has something to do more and then stopped by a man in yellow clothes (Ryugo-kozo?). Next morning Koten brings sake to the well and finds O-Towa dead. Koten knows that she suffers tuberculosis. There is a flute by the side of her and it is the one Manchiyo searched in the headquarter of Ieyasu. In her funeral, Nankei doesn't chant sutra for her because the order goes wrong. Her coffin is brought to a hidden village. Then Nankei gives Manchiyo a white stone of go to him and tells him never forget the spirit of the Iis. Then Manchiyo negotiates with the Hojo clan well and celebrates his genpuku at last. He calls himself Naomasa and many samurais concerned with the Iis rally round him. 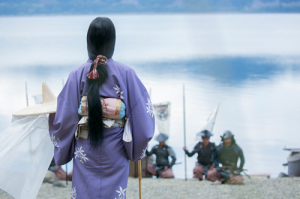 Takase gets married and Naomasa distinguishes himself in the Battle of Komaki and Nagakute. The Ii clan becomes one of great daimyos under the Tokugawa shogunate (***). 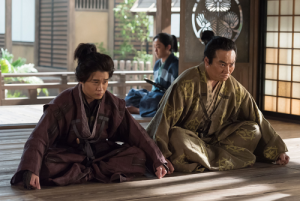 The series finished last Sunday and I will write about "Sego-don", Taiga Drama series in 2018 in addition to other series includes "Furin Kazan" next year. Anyway this series seems to be far from what Taiga Drama series should be. I will upload about what I felt or thought about the series later - maybe after Christmas. (*) She appears there suddenly and it is not clear how she comes there. (**) Needless to say, O-Towa gets to knows Ryuunmaru as an adult man and it's impossible for her to recognise him in his childhood. In the episode, the ship he goes aboard as interpreter wrecks and it kills him when O-Towa meets Kamenojo and Tsurumaru. (***) Ii Naomasa was wounded in the Battle of Sekigahara and died of it in 1602. 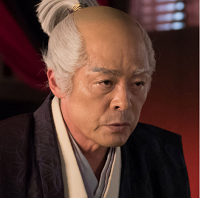 AKECHI Mitsuhide thinks that ODA Nobunaga plans to kill TOKUGAWA Ieyasu. So he attempts to set off a riot against Nobunaga. Then Manchiyo asks O-Towa to make him escape to Mikawa in safety. Ieyasu with his vassals who leave Azuchi Castle are scheduled to visit Honnnoji Temple where Nobunaga is going to demonstrate a tea ceremony on the second of June, 1582. 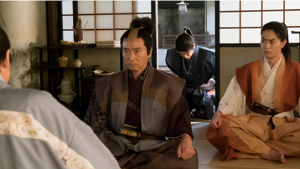 O-Towa, OKUYAMA Rokuzaemon and NAKANO Naoyuki visit Sakai and asks MAKAMURAYA Yodayu to equip a ship for Ieyasu and his party and then she meets Ryuunmaru again. He is an interpreter between Japanese and Portuguese. He says it needs to equip a western ship to allow Ieyasu escape secretly. Then Ryuunmaru makes O-Towa in clerical garment entertain a Portuguese merchant in exchange of using his ship (*). Then he sends him to sleep and leaves there with O-Towa. 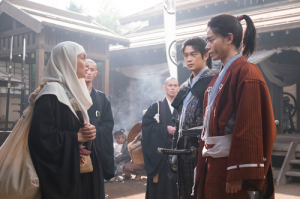 But Mitsuhide is ordered to support HASHIBA Hideyoshi who attacks the Mori clan in Chugoku region. Because of it, Mitsuhide cannnot get in touch with Ieyasu and then Ieyasu decides to visit Nobunaga. But O-Towa, who stills tries to stop him borrows money from SETO Hokyu to play a trick. Ryuunmaru, Hokyu and some other men disguise themselves as travelers and meet Ieyasu on his way to Kyoto. They tell him that there was a riot but ANAYAMA Nobutada, who also serves Nobunaga regards their behaviours unnatural. 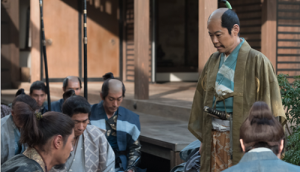 Ieyasu and his party tell them that they go to Kyoto under the pretext of revenge on Mitsuhide for Nobunaga, but he is accompanied by very few vassals. Ieyasu realises that it is impossible to do it at once and he about to committ suicide there (**). Then SAKAKIBARA Yasumasa advises him to return to Mikawa first and prepare for it. Then they hide themselves in a hovel and HONDA Masanobu and Ono Manpuku appear to offer them meal. On the following day, he murders Nobutada who seems to know the trick. After their return to Mikawa, he doesn't fight against Mitsuhide and sees which way the wind blows. (*) Though Ryuunmaru tried to elabprate a plan to borrow the ship, I think it is impossible from various aspects. (**) I have a feeling that something is put of place in the scene. In so-called Shinkun Igagoe, Ieyasu's return to Mikawa via Iga province (northwestern part of current Mie), he and his vassals were chased by the troop of Akechi Mitsuhide who was hostile to Ieyasu. Then he was cornered and decided to commit suicide but was stopped by his vassals. But in this episode, he is not chased by anybody. So committing suicide in such a situation doesn't make sense. Some viewers point out the worsening of historical facts in the series on the internet. TOKUGAWA Ieyasu is informed that ODA Nobunaga will visit him on his way from Kai to Azuchi. Ieyasu then maintain roads, dams up a stream, and shows him sumo matches during his stay. Though the entertainment costs money, he is so satisfied with it and plans to invite him and his vassals to Azuchi castle to return a courtesy. But it means the defense of his territory become to be vulnerable. And IMAGAWA Ujizane also visits Ieyasu to meet Nobunaga to thank him the destruction of the Takeda clan but he has another reason. After Nobunaga departed from Hamamatsu, a little boy is found near the well of Ryugu-kozo. O-Towa shelters him in Ryotanji Temple and finds he is a son of samurai and is called Jinen (*). However he disappears on the following day. O-Towa and Ketsuzan see a strange man near the well and chase him. It is Ujizane who pulls the wires from behind. Jinen is a son of AKECHI Mitsuhide and Ujizane allies himself with him to bring down Nobunaga. He tells O-Towa that Nobunaga's visited Hamamatu in preparation for the attack on Ieyasu. Ujizane thinks that O-Towa thinks to avenge her relatives at the Battle of Okehazama and Sena. But she decides to tell Ieyasu about it and plans to make internal trouble in the Odas (**). Then Ieyasu can govern Japan instead. 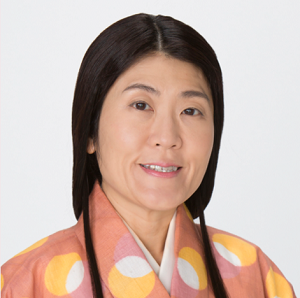 Ieyasu agrees with her and says he would like to make the whole country peaceful (***). And O-Towa and the priests in Ryotanji take care of Jinen. O-Towa remembers that both Naochika and Toramatsu (Manchiyo) were sheltered in the temples in their childhood. (*) He is thought to be one of the sons of Mitsuhide and died after the Honnoji Incident. (**) Clearly, it is impossoble for O-Towa who is a farmer to tell Ieyasu about the plan of assassinating Nobunaga directly. (***) However he fought against the army of ISHIDA Mitsunari in 1600 and destroyed the Toyotomi clan in 1615. Thanks to Manchiyo's advice the he should be honest, TOKUGAWA Ieyasu reflects on himself seriously. And he asks them to continue helping him from from now on. Then his army and the reinforcements dispatched by ODA Nobunaga surround Takatenjin Castle of the Takeda clan on a large scale. Though Ieyasu plans to make the enemy surrender bloodlessly, Nobunaga doesn't allow it. And both OKUYMAMA Rokuzaemon and NAKANO Naoyuki supply logs for the forts near the castle. O-Towa considers to establish the world without any war. Nobunaga is all powerful now but ANKOKUJI Ekei, a diplomat monk of the Mori clan says he will fail soon. 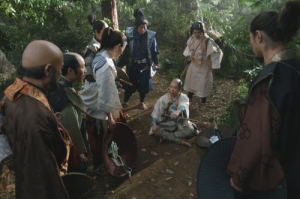 And in the woods, Rokuzaemon and Naoyuki finds some labourers are the spies of TAKEDA Katsuyori and take them to Ieyasu. It increases the grant of Manchiyo to 20.000 koku then he thinks to make them serve him. He has no intention of returning to Ii-no-ya. And the soldiers in Takatenjin castle attempt to surrender but finally they fight against the soldiers of Ieyasu. O-Towa realises that Ieyasu tries to win the enemy to his side and remembers that she had the similar opinion. 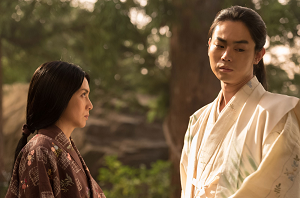 Then she finds Naoyuki near the well of Ryugu-kozo and he tells her that he will not serve Manchiyo and guard Ii-no-ya but at last he accepts his offer. After that, Katsuyori is beaten by Nobunaga and Ieyasu and his head is displayed and his former territory is divided among the vasssls of Nobunaga and former vassals of Katsuyori. Then Ieyasu can get Suruga. It is his earnest wish. I think the conflict between the alliance of Nobunaga and Ieyasu and Katsuyori should be described more. O-Towa goes to Okazaki Castle to meet Sena but she sees the vassals of TOKUGAWA Ieyasu capture his son Nobuyasu there. Both Manchiyo and Manpuku are there also. Ieyasu tries to gain time to prolong the time of Nobuyasu's execution by changing the castles where he is confined. Meanwhile he plans to ally him with HOJO Ujimasa mediated by IMAGAWA Ujimasa (*). But Sena who disappears with ISHIKAWA Kazumasa leaving a letter from TAKEDA Katsuyori to confess her betrayal to Ieyasu. And they meet O-Towa, Manchiyo and Manpuku when they stop by Ii-no-ya. 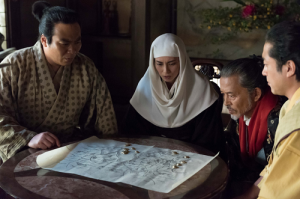 Manchiyo tells them Ieyasu's plan at Ryotanji Temple and says that Sena is accused and chased by some soldiers. O-Towa tries to shelter her and Kazumasa. However she prepares herself for the worst despite the objection of O-Towa. She departs from the temple and parts with Kazumasa. Then she is captured by the soldiers and beheaded near Lake Sanaru (**). After that Ujizane visits Hamamatsu Castle to inform the alliance but he sees a bucket holding Sena's head and feels sad. 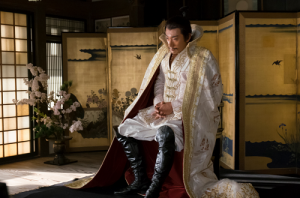 SAKAI Tadatsugu tells ODA Nobunaga that it is Sena who communicated with Katsuyori secretly but at last Nobuyasu is executed on the 15th of September, 1579. O-Towa sighs over the ruthlessness of the troublous period near the well of Ryugu-kozo. 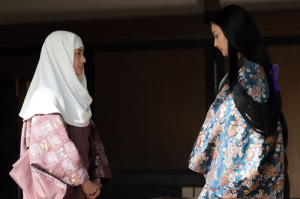 Nankei who hears it tells her to improve it by yourself and later she visits Hamamatsu Castle to meet Ieyasu but cannot. He becomes to distrust his vassals and says that he will decide everything by himself. But Manchiyo tells him that he should find out the cause of "defeat" and correct it. And he hands Sena's rouge case to him ans says Sena is always with him (***). It is the one Sena gave to O-Towa at Ryotanji. (*) The alliance is established due to Otate no ran, the riot over the succession to the Uesugi clan but it is not described in this series. (**) In reality, she is said to have been assassinated. (***) It seems strange that Manchiyo advises Ieyasu in this way. AKECHI Hyuganokami Mitsuhide was a vassal of ODA Nobunaga. Though having served Nobunaga, he attacked him stayed at Honnoji Temple in Kyoto on the 2nd of June, 1582. The details of his descent is unknown but he is said to have been from the Toki clan. After the death of SAITO Dosan whom he served, He went to Echizen (current northern part of Fukui) and served the Asakura clan who ruled there. Around 1570, he became to serve Oda Nobunaga and distinguished himself both in battles and politics. However, he is said to have been at odds with Nobunaga and it was one of the reasons why he attacked Nobunaga who stayed at Honnoji Temple with few vassals. Other than that, there are many reasons why he did so and a letter found recently says that he was eager to reestablish Muromachi Government destroyed by Nobunaga. Anyway he attacked the temple and Nobunaga killed himseld then. After that, HASHIBA Hideyoshi who knew the news returned from Chugoku region and beat him and his army at Tennozan. He was killed by a farmer during the escape to Sakamoto Castle. He had a knowledge of how to perform a tea ceremony and was good at making waka (poem). He made a poem that suggests his decision a few days before the Honnoji Incident. No hime, wife of Nobunaga is said to have been related to him. 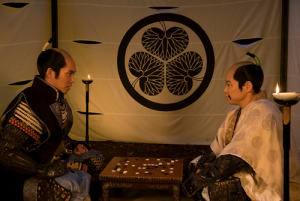 In this series, he is a loyal vassal of Nobunaga and pressures SAKAI Tadatsugu into accepting that Nobuyasu communicates with the TAKEDA clan secretly. But at last he betrays Nobunaga and attacks him. The page who planned to assassinate TOKUGAWA Ieyasu is related to a vassal of Nobuyasu. So his vassals are ordered to live in their fiefs, not to live in the castletown around Okazaki Castle as punishment. Then Nobuyasu decides to achieve a military exploit to clear his name though SAKAI Tadatsugu is not keen to permit him. In Hamamatsu, one of the concubines of Ieyasu gives birth to a son and Manchiyo is sent to Okazaki Castle to tell it to Nobuyasu and Sena. Sena feels unsafe because Nobuyasu has not had his heir yet. She searches a concubine for him and sends a letter to O-Towa about it. At the same time SETO Hokyu informs her about Ieyasu's new son. However, Toku hime, wife of Nobuyasu writes about the behaviour of Sena to her father ODA Nobunaga. Then AKECHI Mitsuhide, one of Nobunaga's vassals is sent to Okazaki Castle and recommends Nobuyasu to receive the official rank from the emperor to give consequence to himself. But he refuses it politely because he feels something suspicious from his words. 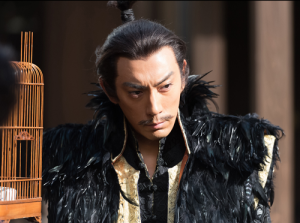 After that Tadatsugu visits Nobunaga in newly constructed Azuchi Castle but is pressured by Nobunaga and Mitsuhide by showing the evidence that Nobuyasu communicates with the Takeda clan secretly. And his concubine is a daughter of former vassal of TAKEDA Katsuyori. Ieyasu worries about it but his mother O-Dai no kata who visits him tells him to kill Nobuyasu. One day Nankei and O-towa who wears nun's hood visit Sena to pray for safe childbirth. She wonders that O-Towa has returned to secular life wearing the hood is convenient for her when she goes to somewhere. At that time, somebody make a noise outside. They see Ieyasu accompanied by Manchiyo and Manpuku there. And SAKAKIBARA Yasumasa is there also and declares that Nobuyasu will be executed because of commnucating with the Takedas. 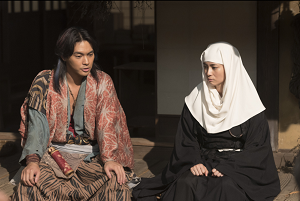 HIRAIWA Chikayoshi, moriyaku (tutor) of Nobuyasu asks Yasumasa to sacrifice himself for Nobuyasu but in vain. And IMAGAWA Ujimasu receives a secret letter from MATSUSHITA Jokei. The letter on a fan is invisible writing but can be revealed by applying heat. It's the request for cooperation from the Tokugawas. (*) It seems that she is an oppotunist. (**) In reality, so-called aburidashi, revealing invisible words or pictures by applying heat is said to have become common under Tokugawa shogunate. The images are from the official website of "Onna Joshu Naotora"
TAKEDA Katsuyori was a son of Takeda Shingen and suceeded his father in 1573. He was born between Shingen and Suwa Goryonin, daughter of SUWA Yorishige. 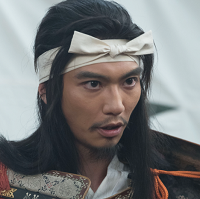 He was born in 1546 as the fourth son of Shingen. He became the head of the Suwa clan at first and had eight vassals. His first battle was the attack on Minowa Castle, Kozuke in 1563. In 1565, Yoshinobu, his half brother and a heir of Shingen was imprisoned in Tokoji Temple. For such a reason, he became a heir (*) and married Ryukatsuin Dono, daughter of ODA Nobunaga. As Shingen died in 1573, he took over the Takeda clan and fought a series of battles against Oda Nobunaga, TOKUGAWA Ieyasu, UESUGI Kagekatsu and HOJO Ujikuni. Especially in the Battle of Nagashino, he fought against the allied forces of Nobunaga and Ieyasu and lost many of his vassals. And in 1577, he once helped Uesugi Kagetora who is from the Hojo clan in Otate no ran, a riot between Uesugi Kagekatsu and Hojo Ujimasa over the headship of the Uesugi clan. At last he mediated between them but they went to war again in his absence because of his return to Kai. The side of Kagekatsu won and he made his half sister marry Kagekatsu. But it made the relationship between him and the Hojo clan became tense. In 1579, he fought against Hojo Ujikuni and Ujimasa. In 1581, he constructed a new castle called Shinpu Castle in Nirasaki but Nobunaga and Ieyasu schemed to make his vassals betray him. He was surrounded by the daimyos who have hostile relations with him and committed hara-kiri at the Battle of Tenmokuzan. Later Tokugawa Ieyasu built a temple called Keitokuin to mourn him. 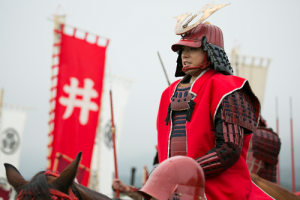 In this series, he is described as the head of the Takeda clan who is defeated in the Battle of Nagashino. Though he tries to make his clan with the Uesugi clan to recover from the discouraging situation, he is forced to committ suicide because of the betrayals of his vassals at last. (*) Shingen's second son was blind and became a priest and third son died young.